To its credit, American Medical News ran the above headline on its first page of its August 10th 2007 edition. "Physician offices using electronic medical records systems and doctors still stuck on pen and paper deliver about the same quality of care, according to a major retrospective study released last month." states the article. As I have long maintained in the Mythology of Medicine, moving from paper to digital records is no more likely to improve medical results than moving from pencils to word processors improved literature. But this isn’t the reason why "we need electronic medical records" is on the lips of every fat cat and politician. It is simply because it will lead to more dollars for them. Note that even despite the grudging acknowledgement of the results of this study, the bias of the AMA editorial staff shows through. Those old fashioned doctors are "stuck on pen and paper", like troglodytes scribbling around a fire. No doubt it is partly because they can’t afford to spend 50 to 60 thousand dollars to add an unreliable and useless layer of complication to their lives. However, since the needs of the medical establishment will compel all practitioners to become enthralled to centralized controls, we can expect more "research" that will ultimately justify increasing the pressure on physicians to join with this glorious vision of the future. After all, "We are all fans of electronic health records," said lead author Jeffery A. Linder, M.D., M.P.H., describing the study's five authors: "we hoped that there would be some association with electronic health records and quality. It turns out we didn't find any." Instead of committing to "champion the cause of freedom in medical practice and the freedom of all Americans", incoming 2007 president of the AMA Ronald M. Davis, M.D., will "work to preserve and protect the primacy of the patient-physician relationship, and the freedom of physicians to practice medicine without undue impediment". One wonders which "impediments" to the practice of medicine will be deemed as "due" by the AMA. Don’t expect any specifics, though the addition of these weasel words to the 2007 President’s Oath clearly signals that the AMA will support any sort of "impediment" if it suits their primary goal to maintain their own profits and power in the U.S. medical establishment. As stated previously, the AMA has done nothing so far to preserve the physician patient relationship from almost complete destruction by Congress and insurance industry fat cats. Indeed, language from the 2007 meeting of the House of Delegates suggesting that the AMA should "pledge…an unshakable and uncompromising commitment to the…primacy of the patient-physician relationship free from intrusion from third parties" was censored as being too "emotive" and "provocative". Unfazed by his demotion from "champion" to "worker", Dr. Davis states, "I believe we need to find a balance between the competing needs for physician autonomy and accountability, in order to accomplish two critically important goals: 1) to maintain the professionalism of medicine and the ability of physicians to give patients the best care possible, and 2) to be responsible stewards over finite health care resources." Fascinating research at the University of Leeds in the UK has shown a direct neural connection between muscles in the neck and a part of the brainstem (known as the nucleus tractus solitarius) which plays a crucial role in regulating heart rate and blood pressure. Acupuncturists have been using these connections to affect the heart and blood pressure for centuries, though this is the first time Western neuro-anatomy has found a possible anatomic basis for this practice. The research suggests why injury to the neck in motor vehicle accidents sometimes results in irregular heart rhythms or high blood pressure, as well as how constant tension in the neck muscles while at a computer or a desk can contribute to these same problems. Neck tightening and a pulling of the head into the trunk is one of the "startle" reactions when people are frightened, so it is reasonable to wonder if abnormally tight muscles in this area can lead to increased levels of hormones and neurotransmitters associated with fear. Daily consumption of omega-3 fatty acids derived either from fish or soya (2 grams of fish or soya oil a day) is able to rapidly improve heart function in older people and thus reduce the risk of heart attack. This study focused on heart variability rate (HRV), the minute variations in tempo and rhythm that are markers of healthy heart function. While the soya oil generated less side effects such as belching and nausea, the fish oil acted faster (3 weeks compared to 8 weeks) and produced HRV improvements across the widest spectrum. (Chest. 2005; 127:1102-1107). Air pollution, particularly in the form of particulate matter, enhances blood clotting and boosts inflammation. Tests of inflammatory and blood clotting responses of human immune cell and umbilical cord and lung cells, within six and 24 hours of exposure, found clotting factors were increased in almost all the cell types along with a significant increase in the rate of immune cell death. (Occup Environ Med 2005; 65: 164-71). Brief inhalation of diesel fumes at levels equivalent to curbside exposure has been shown to decrease blood flow to the heart in patients who have stable coronary artery disease even though they are on appropriate medications to prevent this. Men who have close social contacts (close friends and family, a close partner, connections with community or religious groups) have lower levels of interleukin-6, a blood marker for inflammation linked to cardiovascular disease, than men with the lowest levels of social involvement. Although no similar link was found among women, the researchers point out that the study quantified the number of relationships a person had but did not assess their quality. (American Heart Association, 45th Annual Conference on Cardiovascular Disease Epidemiology and Prevention, May 2005). A Swedish study has identified a significantly greater risk of brain cancer among rural users of the GSM mobile phone network than among rural non-users and urban GSM users. Transmission masts in rural areas are less densely situated than in urban areas and therefore have to transmit a stronger signal with consequently higher doses of electromagnetic radiation. (Occupational and Environmental Medicine 2005;62:390-394). Drinking alcohol while breastfeeding delays the production of milk and reduces the quantity of milk produced. However, as long as there is a delay between drinking and breastfeeding, there is unlikely to be any direct harmful effect on babies from the alcohol. (Clin Endocrinol Metab 2005 90: 1979-1985). Moderate consumption of alcohol appears to reduce levels of creatinine (a strong indicator of kidney dysfunction) in the blood. In data collected from 11,000 men enrolled in the ongoing Physicians' Health Study, it was found that men who consumed at least seven drinks a week had a 30% reduced risk of elevated creatinine levels compared with men who had one or no drinks a week. (Arch Intern Med. 2005;165:972). Cancer-prone laboratory rats fed the human equivalent of one, three and six apples a day, had reduced incidences of tumors of 17%, 39% and 44% respectively. In rates with breast cancer, a similar apple consumption reduced tumors by 25%, 25% and 61%. (J. Agric. Food Chem., 53 (6), 2341 -2343, 2005). Exposure to mold and dampness in homes as much as doubles the risk of asthma development in children according to a study of 1,984 Finnish children aged 1 to 7 years over a six-year period. The study focused particularly on four indicators or moisture or mold in the home, including mold odor, visible mold, visible moisture, and history of water damage. (Environmental Health Perspectives Volume 113, Number 3, March 2005). Hypericum (St John's wort, 900 mg/day) extract appears to be more effective than paroxetine (Paxil, a selective serotonin reuptake inhibitor/SSRI) and is better tolerated as a treatment for moderate to severe depression. (BMJ 2005 330: 503). Another study has revealed that babies exposed to SSRIs in the womb, may be born with withdrawal syndrome, characterized by convulsions, irritability, abnormal crying and tremors. The majority of cases were associated with paroxetine. (Lancet 2005; 365: 482-87). Laughter promotes vasodilation and increases blood flow, according to a study of 20 health volunteers who watched clips of two movies – one violent one (the opening scenes of Saving Private Ryan) and the other a comedy. Blood flow was significantly reduced in 14 subjects after watching the violent film, and increased in 19 subjects after watching the comedy. (March meeting of the American College of Cardiology, Orlando, Florida). Like the monsters from horror movie sequels, the robot doctors project ("What Were They Thinking", March 2007) remains inexplicably alive. For some reason, I just can’t seem to understand how a motorized television will improve medical care. 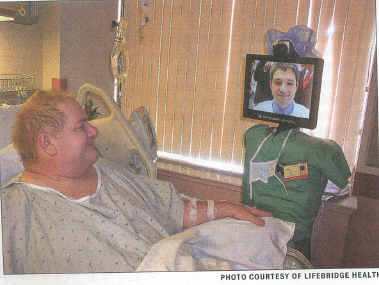 But, there it is, in the July 2007 Journal of the American College of Surgeons: Robots Shorten Patient Stays. In this landmark study, 92 patients of 376 patients who had surgery at Sinai Hospital of Baltimore for morbid obesity were selected to have a post operative visit from the "robot" surgeon. These patients left the hospital sooner than the 284 patients who had postoperative visits from an actual surgeon. The mean length of stay was 1.26 days for the group that had robot visits and 2.33 days for those with only physician bedside visits. "It drops a whole day off. It’s a benefit for health care. It’s a benefit for the patient", bubbles Alex Gandsas, M.D., lead study author and head of bariatric and minimally invasive surgery at Sinai Hospital. The study noted that the hospital had a financial gain of $220,000 from the early discharges, perhaps explaining Dr. Gandsas’ enthusiasm for the results: "We’re trying to create more empty beds so more patients can be accommodated", he stated. No doubt the doctor is also pleased at the prospect of those extra surgical fees. Perhaps we don’t need expensive mobile televisions to chase patients out of hospitals after surgery: why not just deliver the same message through the television in their room, or call them on their cell phones? Playing obnoxious music though their bedside speakers might work. Even more money could be saved by not delivering patients their meals or stopping their nursing care. Motorized hospital beds could just be programmed to stand them on their feet at some point after surgery, also. Gee, for half of that $220,000, I’ll go in there myself and throw them out.